Construction on Pavilion V began in the summer of 1819 and was completed in 1823 with the installation of the Ionic marble capitals. The design is based on Palladio's Ionic modillion order published in Giacomo Leoni's London edition of The Architecture of A. Palladio in Four Books. Pavilion V underwent extensive renovations in its history that ultimately doubled its size, beginning as early as 1829 with the construction of a two-room office to the rear. Its Jeffersonian flat ridge-and-furrow roof proved to be leaky, and was covered over with a slate hipped roof circa 1837; the original roof is extant as the floor of the attic. In 1850, at Professor Gessner Harrison's request, a rear annex was built and connected to the original building with a narrow hyphen to accommodate his family. More alterations were made between 1903 and 1929 as the Pavilion became the home of both Professor Kent and his son-in-law Professor Smith, including the filling in of the area around the connecting hyphen and the addition of a rear porch. After Kent's death in 1928 (his having occupied the Pavilion for nearly seven decades), the Board of Visitors decided to convert Pavilion V into two residences. Pavilion V continued to be occupied by two different professors until the 1992-1994 restoration, which retained the Pavilion's 1929 outward appearance. 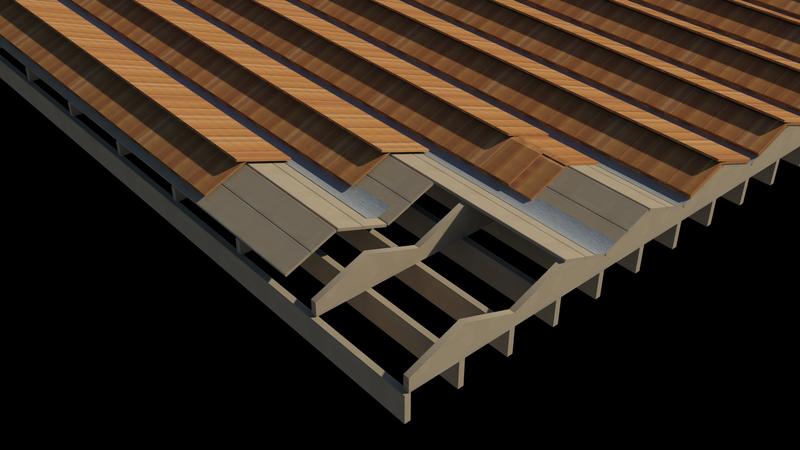 Jefferson's original roof has been reconstructed in the model based on photographs and details found in the Pavilion V Historic Structure Report as well as Jefferson's original drawing.